Coyote Point Yacht Club is located at Coyote Point Park in San Mateo, between the bay Bridge to the North, and the San Mateo Bridge to the South. Within the park grounds, you will find the CuriOdyssey Museum and the Poplar Golf Course. The park grounds also feature biking and walking trails, as well as picnic tables. The club features a guest dock, an expansive backyard with BBQ facilities, showers for men and women as well as monthly locker rentals, and free ice. A pump-out station and gas dock are available at the marina. Members enjoy reciprocal privileges at most yacht clubs in the SF Bay Area and at many clubs worldwide. 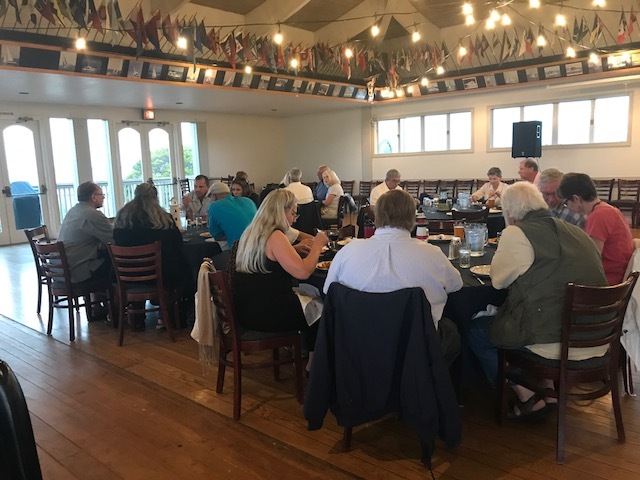 Club burgees in our Commodore’s and Regatta rooms attest to our members’ visits to other yacht clubs and visiting yacht clubs to CPYC. For more information on joining CPYC, click here. Unless designated otherwise, children are welcome at all club events as guests of members. The club has a large, enclosed back yard with plenty of space for children to play and run. Age appropriate games and activities are available for check out. The club also has a widely popular Youth Sailing program, with sessions every summer. A few of the current club members got their feet wet (literally) with this popular program. For “Old Timers,” there are occasional “Old Time Brunches” where long-time members can get together and reminisce. Members participate in inter-club races, as well as informal “Rabbit Race” series. Ever dreamed of trying your hand at sailboat racing? CPYC holds informal “Sunset Races” every Wednesday evening, from April-October, and Winter Races on the 2nd and 4th Sundays from January-March. Hone your skills as a racer, meet the local skippers, perhaps join a crew, or just get a taste of what sailboat racing is all about. For those who become more serious about the sport, arrange to crew on a boat during the monthly CPYC regattas, which are typically held the first Saturday of the month, or you can always buy your own boat and join us! After the race, come relax with your fellow sailors at the CPYC clubhouse and bar! Events after each individual race will vary, but may include cookouts, potluck dinners, live entertainment, etc. 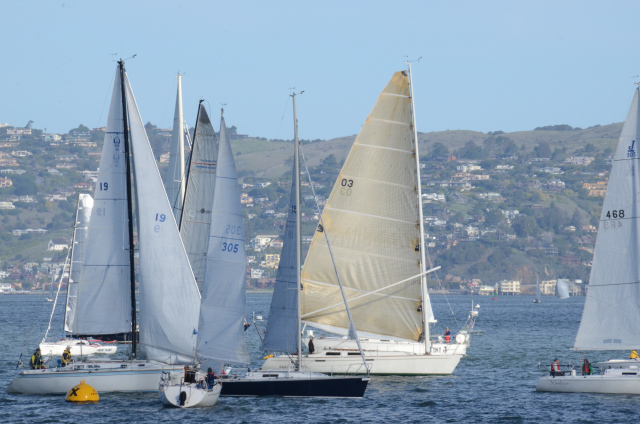 CPYC is a member of Pacific Inter-Club Yacht Association, where you will find many other opportunities to race with fellow club members from various yacht clubs around the Bay Area. Members enjoying an on-the-water tailgate party in McCovey cove before taking in a Giants game. Our cruise season is year-round. 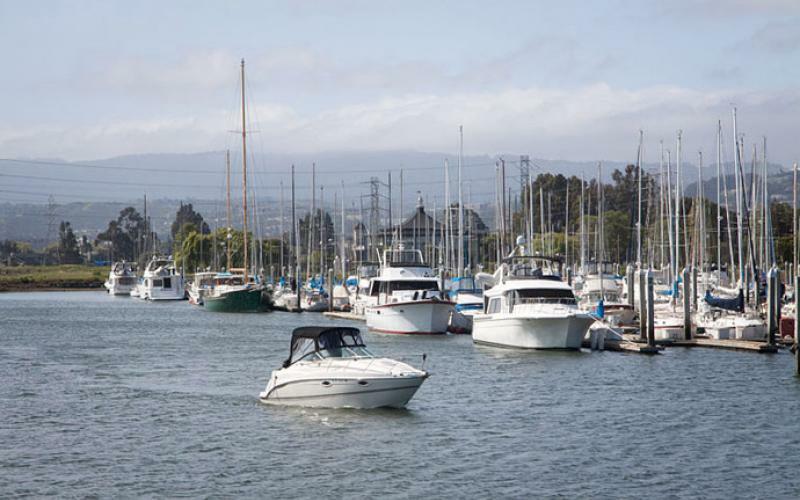 Members take their boats to various destinations or yacht clubs around the Bay and Northern California. Past destinations have included Half Moon Bay, Napa Valley Yacht Club, South Beach Yacht Club (with a post-cruise raft-up in McCovey cove for a Giant’s game), Angel Island, and the ever-popular Labor Day cruise to Marin Yacht Club. All of our cruises are family friendly, and most destinations are accessible by car (asphalt cruising) or boat. For more information on the cruise schedule, or to sign up, click here. Our newly renovated Commodore’s Room dining area is the perfect place to enjoy a Friday evening dinner. Our clubhouse features an expansive backyard, with a play area for children and a large BBQ for informal cooking. Relax in our downstairs regatta room lounge, featuring a fully equipped kitchen, large TV and comfortable seating. On the second floor, the recently remodeled Commodore’s Room features an expansive dining area, with a full bar, cocktail lounge, and a professional bar-tender on Friday nights. Our outside deck features beautiful vistas of the Bay; watch the sunset or moonrise in the evening, or, during the day, engage in “plane spotting,” or enjoy take in one of our regattas from dry land. The club serves lunch on Fridays from 11:30 a.m. to 2:00 p.m; and dinner on Fridays and Saturdays from 5:00 p.m. to 8:00 p.m. The club hosts special guest chefs on a regular basis; check the galley calendar for current lunch and dinner menus. The club also hosts holiday brunches and special events for all ages. If you are interested in visiting the club, please contact one of our officers for a tour, or attend one of our Open House events. We can reinstate you. Please contact me at gary.edwards@haynesboone.com or our club manager Carly at office@cpyc.com. Hi guys! I used to sail on/off for 25 years. Now I live in San Mateo and looking for refreshment course / or just hand on sailing . Maybe I should take refreshment course like in scubadiving after long idle period. Your club is really close to me and I would love to participate. I’m interested in sailing and have no experience. Can you recommend any class for newcomers? Family classes would be even better, as my wife and kids are also interested. Need crew? I’m happy to volunteer for up to a week! I have the Day Skipper RYA sailing license. Happy to help with repair work or during sailing days. Hi, This is Stephanie Bauer and Anne Pernichele #317. We have lost one of our key cards, Stephanie’s, and would love to pick up a replacement today if possible. Will anyone be in the office today? Please call me if you can 503-805-9183. Thank you!